Frederick William Newton Wilson (Newton as he was known) was born 17 April 1916, the first child of Ernest Arthur (Ernie) and Alice Wilson. Ernie Wilson and Alice Newton were both from prominent Drury families. 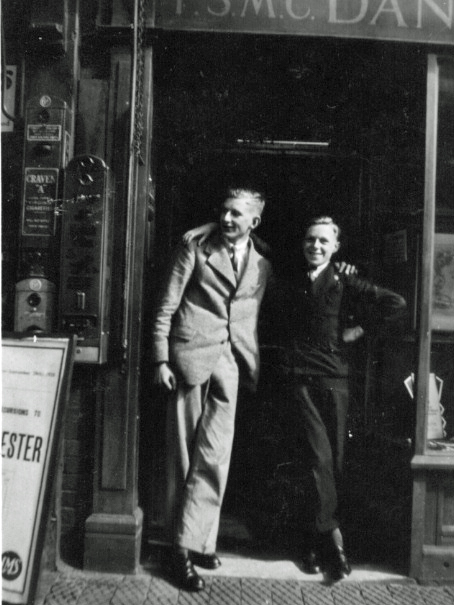 Ernie’s brother William formed Flintshire Haulage Company and was Chairman of Buckley Urban District Council in 1925. Alice’s father, William Newton, was surveyor to the Hawarden Rural District Council, a successful farmer, and Chairman of Buckley UDC. As children, Ernie and Alice lived next door at Drury Bank and Drury Villa in Bank Lane, Drury and they married at St. Mathew’s, 14 April 1910. They went to South Africa where Ernie worked as a mining engineer and returned in 1915. Ernie Wilson died 20 May 1923 aged only 48 when he was injured in a road accident and contracted tetanus. Alice Wilson later lived at 51 Liverpool Road and outlived her husband by 55 years, passing away in 1978 aged 94. 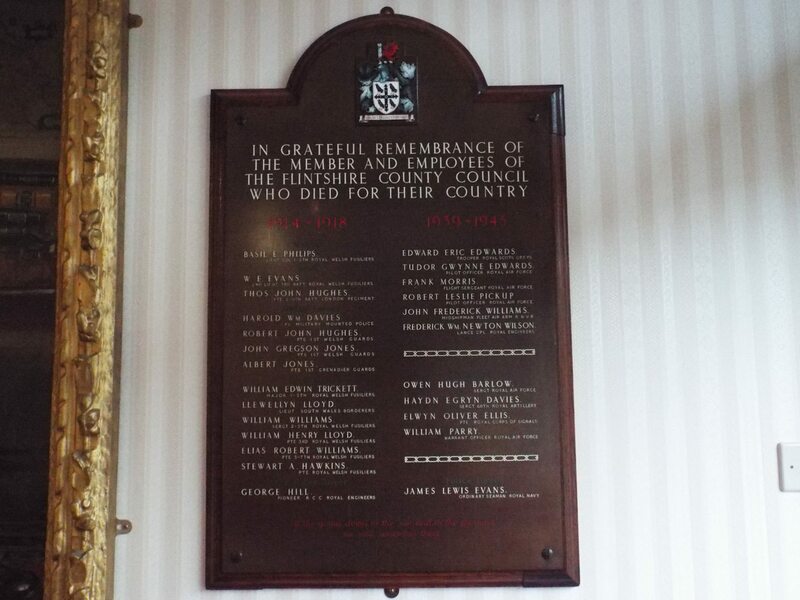 Little is recorded of Newton’s early life but a memorial plaque in County Hall shows that he worked for Flintshire County Council. 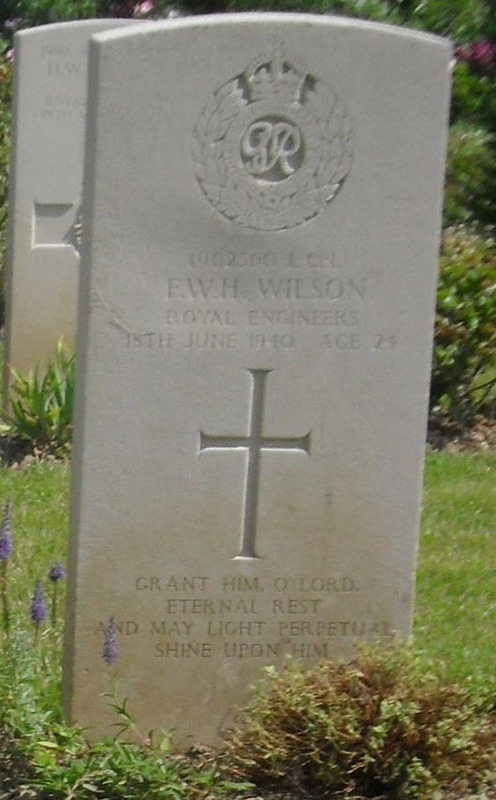 Lance Corporal Frederick William Newton Wilson of the Royal Engineers died of wounds in France, 18th June 1940, aged 24 and was buried at Rennes Eastern Communal Cemetery. Army casualty records show that at the time of his death he was attached to No-1 Engineering Store RE, Supply Base Depot, Rennes, France. In some records he is listed as a sapper (as privates were known as in the Royal Engineers) and in others as lance corporal suggesting promotion shortly before he died. The circumstances of Newton’s death are inferred from the Commonwealth War Graves Commission website which says “the majority of the casualties buried here resulted from the bombing of a troop train by the Germans on 17th June 1940”. After the evacuation of Dunkirk, British troops remaining in France and French refugees were pushed westwards by the German advance under Rommel. They hoped to escape by ships from ports such as St. Nazaire. On the 17th of June several trains held up at Rennes were bombed; most unfortunately, one of these trains was carrying a cargo of high explosives, artillery shells and cartridges. After the munitions train was hit explosions continued for two days. Many people were rescued by courageous railway workers, firemen and soldiers, but many of them would die later as seems to be the case with Newton whose death was recorded on the 18th. Over 800 people died including 175 British soldiers. An irony of this tragedy is that the soldiers and refugees were trying to reach ships to escape France. One such ship, the Lancastria sailed from St. Nazaire on the 17th and was sunk within hours by German bombers. The ship was a passenger liner designed to carry 1,300 passengers but it left St. Nazaire with at least 6,000 on board and perhaps as many as 9,000. Only 2,447 were rescued and arrived in Britain. With between 3,000 and 6,000 fatalities this was the greatest maritime disaster in Britain’s history. According to the website Wikipedia and other sources, more people died on the Lancastria than on the Titanic and Lusitania put together. Newton’s brother, Arthur Wilson, volunteered for the RAF when war broke out but he was turned down because he was in a reserved occupation at Courtaulds, Greenfield. He later changed the description of his occupation and was accepted. After training in Canada he served as a pilot flying the B24 Liberator in Coastal Command. On the 29th of May 1941 Arthur was at home when the German bomber crashed in the Okell Farm fields behind Liverpool Road and Ewloe Place (reported in the Buckley Magazine, 20, 21, 23, 28, 29). Arthur went out to help and returning to the house met Olwen Iredale who was making the morning delivery from John and Lily Iredale’s bakery in Lane End. Olwen and Arthur married in 1945 and lived in Alderley Edge, Cheshire until Olwen died in 2011 and Arthur in 2015. Their son and grandsons still live in Alderley Edge. Olwen’s sister, Joan Iredale married Charlie Kelsall and was this author’s mother. Another Wilson brother, Colin lived in Drury. A fourth child, Alice Mary died in 1923 aged 7 months.